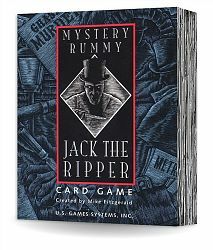 Jack the Ripper attaches an interesting theme to the traditional Rummy framework. Playing Victims, Suspects, Scenes, and Evidence-meld, players try to build a case against various suspects for the famous Jack the Ripper serial murders. Whichever suit has the most cards played in it when a player goes out is the guilty party. However, if all the Victim cards come out before the end of the game, the Ripper might escape giving the player who produced the card a significant point allowance.